My memory works in funny ways. As interesting as I find them, I cannot for the life of me remember interesting or useful figures or statistics. I’m awkwardly bad with faces but surprisingly OK with names. I remember things better when I write them down – even if it’s just copying a text written by someone else – but I remember best of all the words of another person. One sentence I remember as clearly as though I were hearing it right now is from my friend and all-round beautiful person Necla; “I’m a big believer in moments,” she told me, shutting off a barrage of half-hearted excuses that were pouring out of my mouth for not doing things I knew I should be doing. Since then, I have been a big believer in moments too – and so, after two VeganMoFos spent watching from the virtual sidelines, I am finally taking part! If you’re not familiar with VeganMoFo, it is a food-blogging event and stands for Vegan Month of Food: the aim is to post 30 times in the month about vegan food. Simple! I haven’t had the confidence to take part before because I’m not a food blogger, and I’m a perfectionist; how could I compete with those expertly staged and photographed food shots, those eloquently described stories, those thoroughly-tested recipes? However, one night – in a spur of creative urge – I set Ben and I a five-minute challenge to think of our favourite food memory and describe it. The more I jotted down, the more I remembered, until I was still furiously scribbling my list well over five minutes later, and recounting each of those memories took close to a half hour. Dammit, I thought – this is why I love writing! And, in the end, it’s what food writing is about; it’s not about having the most innovative recipe or the most appropriate props – though I always appreciate those too – it’s about conjuring up that sense of shared memory, of belonging, of community. In fact, I remembered how both last year and the year before, Amey of one of my favourite blog Vegan Eats & Treats served us up a month of “Noshtalgia” (what a great name!) and amidst all the stunning food photography and enticingly inventive recipes that flooded the internet, it was her honest and heartfelt posts that I looked forward to the most. 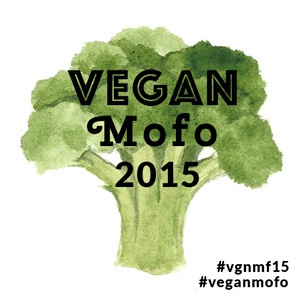 This year, VeganMoFo has changed a little – I was initially disappointed, as barely hours after deciding on a theme that had motivated me to participate, I was finding out that we were being encouraged to move away from a theme and to respond to daily prompts. I considered abandoning my impulse to take part in the challenge, but I figured the whole point of a challenge is to challenge yourself. So I will do my best – some posts will be long, some will be short, some will be illustrated, many will not – and undoubtedly many posts will be missed (I start my Masters halfway through the challenge, so all bets are off!) – but I am excited to be taking part. I hope you will enjoy reading my posts, and reminiscing along with me! So… who remembers their first all-vegan (food) festival? Who has never been? I remember my first and second times at Vegfest in London, and I’m eagerly looking forward to my third visit on October 10th and 11th (conveniently right before my birthday, in case you don’t know who to buy excess vegan cake for…). I think whether you are a new or experienced vegan, vegetarian, or simply interested in plant-based foods and eco-friendly, cruelty-free products, it’s an event everyone should experience. Luckily, I have two sets of weekend tickets (worth up to £22 each) up for grabs! So clear your schedule, grab a friend, and get ready for a weekend of sampling, tasting, devouring, sharing, learning, trying, and buying! All without a jot of label-reading or question-asking!